Vincent is a cat who lives on a cargo ship that travels from port to port. He has never set foot on land. While he overhears the sailors talk about “home”, Vincent wonders where home is for him. 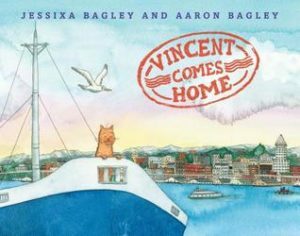 This is a beautifully illustrated book that teaches a great concept of what home is and why it is so wonderful. I love the soft details and simple text.